What was your dream when you were a kid? I know my dream gradually evolved along the years but the two things I have always wanted to be were a teacher and a mother. Yes, I did dream of becoming an entrepreneur too but deep know, I did realise that was a little too far-fetched. In a sense, most of my dreams came true for me and even up till this day, I still have the passion to teach and the desire to raise my own kids. Remember I told you that at four years old, Angel has a long list of ambitions including wanting to be a teacher, doctor and zookeeper? While I do think it is totally fine for her to slowly find a sense of direction in her life and determine what she truly wants to be in future, I also think I ought to let her know about the importance of having a dream. That was even more emphasized by the fact that instead of stating her own ambition during her Show and Tell session in school, she decided to copy her best friend instead and announced that she wanted to be a singer. Dream Big, the second in Nick Vujicic's Give Me a Hug series, is the perfect book to start teaching my girl about having dreams, learning from failure and overcoming fear with courage. While the first book shares the stories of Nick from childhood to adulthood, Dream Big describes Nick's adventures in pursuing his dream. Through eight chapters and principles of life, Nick shares about the challenges he faced and the precious lessons he gained from his experiences. To have a dream is to have faith and to pursue life with purpose. Our life is driven by our dream. Dream exists in our hearts long before it comes true. Just like a tree. Before it grows to be a tree, a seed has to be planted." I like how Nick sees a dream as a seed. Likewise, I too believe that there is a seed of dream in every child's heart and with good care like positive words, nurturing care and acts of love, these seeds will grow to become big, strong trees. On the other hand, negative thoughts and discouraging words will only channel negative energy and water the seeds with polluted water. Like the first book, at the end of every chapter, there will be a summary of the lesson learnt. For me, I think this might be too difficult for Angel to comprehend and I have to translate it in layman's terms for her. Actually, I do think the lessons learnt are more suited for the parents to read and act as constant reminders for ourselves. Other than encouraging children to have a dream, this book also reminds parents to give positive strength and have faith in our kids so that they can have believe in themselves in the first place. It was also interesting and enlightening to read about the challenges that Nick faced in his life adventures, for instance how he learnt to pick himself up from a fall using his head, how he overcame his fear of jabs and how he made 53 calls before he finally found a school who was willing to let him speak to the students. We see him as a successful and renowned motivational speaker now but what we do not realise is that it took him a lot of effort, perseverance and faith to get to where he is today. And all this would not have come true if he did not have a dream when he was just a child. Once again, the charming, vibrant illustrations by Dreamergo in Dream Big help to emphasize the message in every story and never fail to capture the attention of the readers. In fact, Angel loves the drawings so much that she will scrutinize them and ask me about every detail, which in turn betters her understanding about the story. I was going to ask her which of the two books by Uncle Nick (yes, we call him that) she prefers and when I was looking for them, I saw that she had removed both Dream Big and Give Me a Hug from her library and kept them in a drawer in her cupboard. Well, I guess I can say that these books definitely have a special place in her room and her heart. 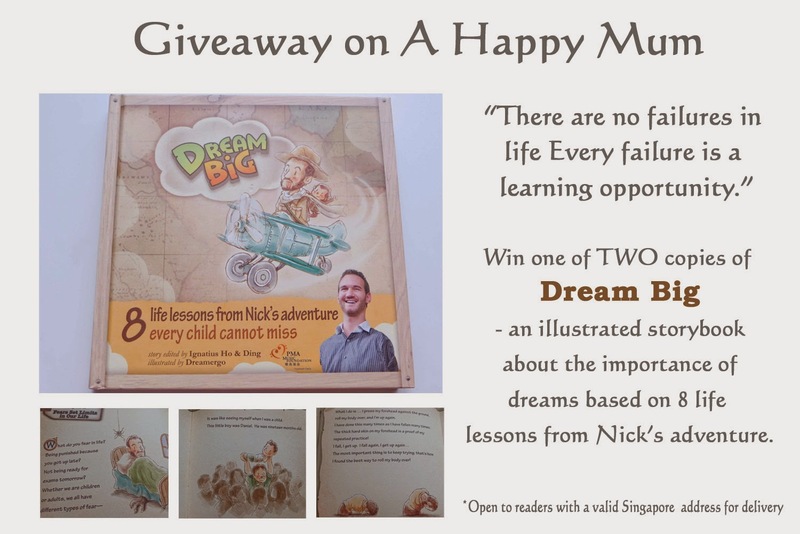 If you are keen to get a copy of Dream Big, here's a giveaway whereby two lucky readers of A Happy Mum will be receiving this motivational and delightful book. To participate, comment in this blog post and and leave your name, email address and answer the question "What was your dream as a child?". This giveaway is open to all readers with a valid Singapore address for delivery. Indicate in the Rafflecopter widget that you have commented and to increase your chances of winning, follow the rest of the options. Best of luck! Disclosure: We received a copy of Dream Big for review purpose. All opinions are our own. I dreamt to be a great scientist. I'm a defence science engineer now, so my dream is sort of fulfilled. My childhood dream was to become a good teacher and also a happy& healthy person when grow up. Wow.. My gal likes to have this awesome book and I think this book can help to motivate her too. My childhood dream was to be a teacher to little children. I dreamt to be a teacher and though my dream didn't come true, I am still coaching my three sons every night. As a child, my dream was to help people in need and make them happy and smile. My childhood dream was to become an aspiring teacher. My childhood dream was to be a flight attendant where I could travel around the world to see, hear & experience new things. I think it will be a good guide for my boys. My dream was to go to under develop countries to help build their community. Dreamt of being my own boss. Today it is a reality, even if it is just a humble little shop. My childhood dream is to be a police officer. 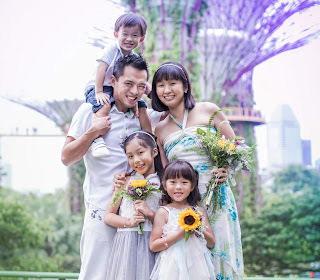 Growing up in a family full of pilots and stewardess, I dreamt of becoming one myself....was happy I got to fulfil my dreams :) and now my lifetime dream is to be spending every waking hour with my 2 babies as a SAHM!!! My dream is to open a cafe that sells my cakes and cookies. My dream as a child was to be a teacher! My childhood dream was to be a teacher. My childhood dream was to be a engineer, just like my father. 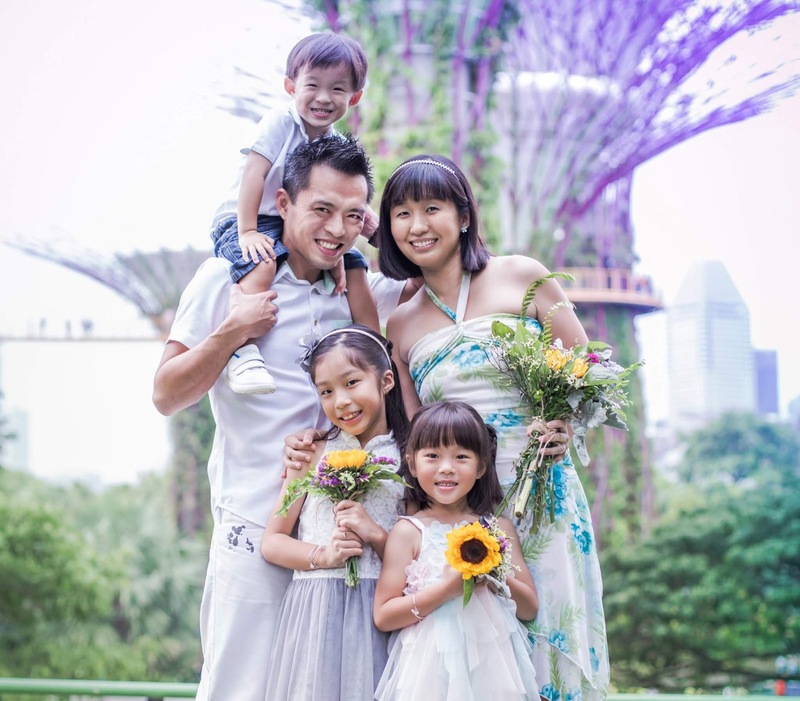 I dreamt of becoming the next national swimmer like Joscelin Yeo! Well, I thought someone will talent spot me but it did not happen. My childhood dream was to become an astronaut or become a police inspector. Haha! I am neither now. I dream of becoming a teacher as my teacher seems to have the answer to all questions. My childhood dream was to be a policewoman. My dream was to be a teacher. My simple dream as a child was to be a teacher.